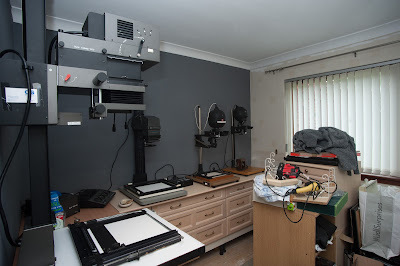 The darkroom as it presently stands. Before anyone says anything, I know I have too many enlargers! This will probably change in the near future now that my darkroom is taking shape and I have to make some decisions about what format(s) to concentrate on, what cameras to keep, etc. From left-to-right above we have the Durst L1200, the Paterson/Philips PCS 150, a Leitz 1c and a Leitz Valoy II. The last is a recent purchase and just sort of arrived out of the blue. That's not entirely true, obviously, as I have various searches set up on Gumtree and Ebay for darkroom stuff, etc, and the Valoy popped into my email inbox as a result of one of them. It was in Inverness and the seller wanted just £25 for it complete with a 50mm Ross Resolux lens. I suppose, with my sensible hat on, I would have let it pass but it's just such a great enlarger. Inverness is a 6-hour round trip from my home and I was reluctant to make the journey but the seller's son was due to visit him and he lived in Edinburgh just an hour away from me. Better still, the son would be passing Perth on his way home so I arranged to meet him there, a much more convenient 30 minutes away. So after a pleasant hour in the car and £25 lighter I had in my possession a lovely bit of kit. The great thing about the Valoy is its simplicity. It's always in alignment, isn't too heavy, is beautifully made and doesn't take up a lot of space. I'm not too sure about the qualities of the Ross Resolux but it's in good condition and I'll find out when I make a print or two. The icing on the cake was that the Valoy came complete with the frosted, anti-Newton's rings lower condenser surface. Not all of them had that feature and there are stories of some printers becoming frustrated with the appearance of the oily-looking marks on their prints. I've been continuing to educate myself about some of the photographers I should already be familiar with and am fixated a little just now on the late Ray Moore. Wouldn't you know it that Ray seemed to have used a Valoy for all his later 35mm black and white output. He had a reputation as a very skilled printer and the Valoy obviously didn't get in his way. He was a hell of a photographer as well and I'm enjoying studying the little there is out there about his life and work. But back to the darkroom. Three enlargers would have left me with a useful bit of dry bench space but the fourth has made things a bit cramped. 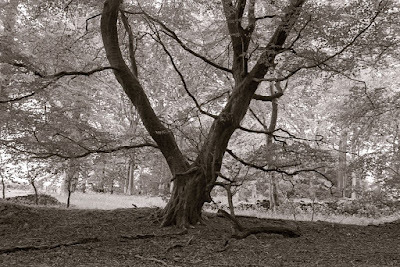 I'm not sure the Durst, which does up to 5x4, will be around forever as my thinking at the moment is that I'll enlarge 35mm and 6x6 negs and maybe contact print the 5x7 output from the Kodak Medalist II but I'll make my mind up once I'm back printing. I've painted two walls of the darkroom - those around the enlargers - dark grey (it's probably zone 4/5) and I'll be painting the other walls a lighter shade of grey. The drawers under the worktop came with the house when we bought it almost two years ago. The owner was an elderly woman and the decor and furnishings were very dated. However, the chests of drawers were certainly OK for darkroom use. 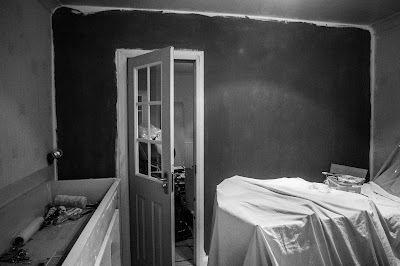 I managed to use other bits of timber and cupboards that we inherited as part of my aim to build the darkroom without spending money on anything other than paint and plumbing in the sink. That's the first time I've had a sink in a darkroom and I'm sure it will be a great boon. Just imagining that I'll no longer have to carry all the usual developing stuff down to the kitchen sink to develop a film is whetting my appetite. Cath has also realised that it will be brilliant for washing the dogs in! No more stooping over a bath for a start. The prospect of breaking a leg jumping out of it will probably keep the little buggers in check as well and stop their attempts at escape. After I've painted the last two walls, I'll have to sort out a black out blind for the window and something for covering the glass in the door. A quick tidy up after that and I'll be ready to do some printing. Three taps! Still, sparkling and hot? Port, sherry, whisky? 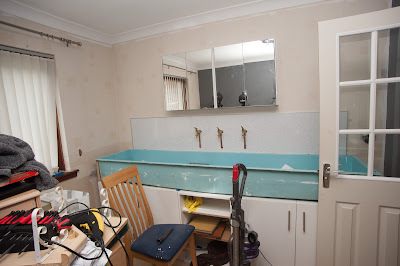 A hinged worktop above the sink would make more space for the Robbins Historical Enlarger Museum. Great to see the progress being made. Not keen on the idea of washing the dog in the sink. Will shake itself dry and water everywhere, disaster! Fantastic. I'm very envious as I can only dream of such a darkroom. I may have space in my bathroom for a bit of 8x10 contact printing. No bad thing. I'm really pleased to see your darkroom take shape. I have a Leitz Valoy 11 enlarger. It's an absolute gem; beautifully engineered , very precise, and delightfully simple and quick in operation. It has none of those adjustments you usually get on enlargers to square things up and make things parallel. No doubt this is because it was engineered accurately and comes perfectly aligned. I'd love to see a good sized print from the same negative (-portion) and lens made from each of these enlargers. It can't be easy to make a choice but it may be helpful in the elimination process. In any event, the darkroom's looking really good! Well, it has certainly been a long time Bruce, but it looks bloody brilliant and I am totally jealous. Nicely laid out too . . . and there's no need to worry about blackout for the window - I know full well you've not told Cath yet about the 'darkroom extension' you're planning by knocking through that wall to house all the extra enlargers you've got planned . . .
Oh and the sink - how glad am I that that lonely, unloved thing I spotted that Saturday is now back and running again! With the took over of the Sinar Norma from a retired photographer ,I came in the possession of two enlarger lenses , Rodenstoch rodagon f 5,6 150 mm an a Rodenstock Ysaron 4, 210mm(need cleaning) , and a tubus for devere enlarger . Amateurs? I give this item's away cause they don't fix on my Durst M605 neither on the Polisch PZO; there are two baseplates with it ...happy darken in the darkroom !